People in the United States are most likely to experience a fire in their home than anywhere else. Cooking is the leading cause of home fires. Almost half (44%) of reported home fires started in the kitchen. 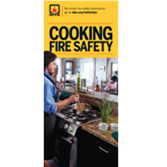 NFPA provides these tools to help you launch a cooking safely campaign in your community. Did you know that cooking fires are the #1 cause of home fires and home injuries? Follow a few safety tips to prevent these fires. For both children and adults, this piece uses many illustrations and easy-to-read language safety messages to prevent the most common kitchen fires. Customize these resources and work with local media to help spread the word about home cooking safety. NFPA presents Dan Doofus in "Kitchen for Trouble". NFPA's Lisa Braxton demonstrates how to stay safe when you're cooking. 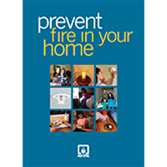 Share tips for avoiding cooking fires -- the #1 cause of home fires and home fire injuries -- with NFPA's Cooking Fire Safety Brochures.